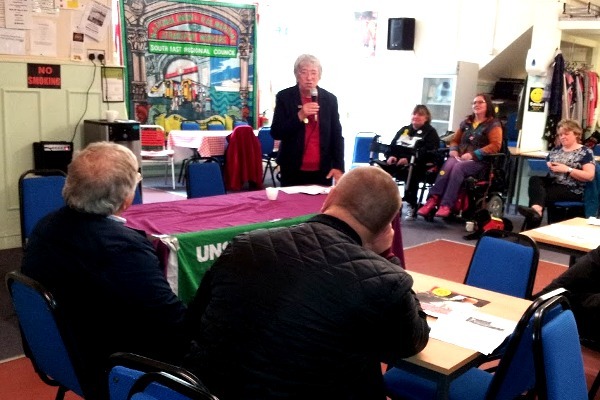 Dot Gibson of the National Pensioners Convention. 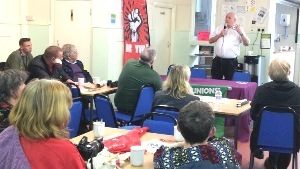 The meeting in Central Hall on Sunday 23 April, which drew an attendance of some 35 people, provided an opportunity for trade unionists and passengers to explore common ground. 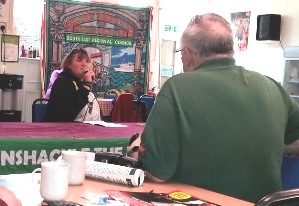 Focusing on the effects of the Southern dispute on passengers, Paula Peters of Disabled People Against Cuts pointed out that the railway system has a long way to go before it is properly accessible to people with restricted mobility, especially wheelchair users. Only 450 stations in the country are fully accessible, Paula said (out of some 2,500). Funding for accessibility equipment has been cut by 50% in the last 12 months. Finding a member of staff to provide assistance is not always easy, she said, noting that the number of platform staff has been reduced in recent years. Making a rail journey involves much more than turning up at the station: a trip has to be booked 24 hours in advance, a lengthy procedure on the phone that can take up to 40 minutes. Despite all that effort, she “almost never” finds that the information has been passed onto the station staff. “I never know if someone will be there to help me on or off when I arrive,” she said. And if people get trapped in the closing doors, having the driver operating the doors represents a risk that can be avoided by having a guard on the train and station staff in attendance. Bus travel is also problematic, with disabled people often unable to access the space reserved for them as parents with pushchairs have got there first and refuse to move. As long as the bottom line on the profit/loss account is more important, things won’t change, warned Gordon Lean, the regional chairman for Unite, which represents some 35,000 transport workers in this part of the country. Gordon was also concerned that if EU regulations currently in force are scrapped as part of the Brexit process, we could return to the situation back in the 1960s when 15-hour working days were allowed. However, when it came to other European links, he wasn’t so keen, pointing out that Veolia is a subsidiary of France’s state-owned railway, SNCF (this appears to be the rail freight operation Veolia Cargo), while Abellio is owned by the Dutch national railways, which meant that other countries were profiting from UK service industries. All these issues should be raised in the election campaign, according to Dot Gibson, deputy general secretary of the National Pensioners’ Convention, who called for a “balance sheet of all that’s been lost in the last 70 years” to be drawn up. She detected attempts by the government to drive a wedge between older and younger people as part of a ‘divide and rule’ strategy. Old people are suffering from austerity just as younger ones are: they haven’t drawn up the drawbridge to keep younger people out, she said. The fact that the workers were standing up against the bosses was a huge step in the right direction, and she couldn’t praise the RMT enough for what it was doing. The unions must continue to be in the forefront of the struggle for rights, she said. What we really need is local jobs – we’re too dependent on London, said Ray Chapman of the East Sussex Rail Alliance, Shrimp – St Leonards and Hastings Rail Improvement Programme and Marshlink Action Group. We’re not a union, he said, but we’re pulling in the same direction. The real problem is that the rail system is 100% privatised, according to Steve Hedley, RMT assistant general secretary. We have an absolute anarchy of a market, what we need is a planned system based on nationalised transport, he said. The only way to get rid of the Tories is to vote labour, he said, taking the opportunity to insert a party political message. Prior to the meeting, participants in Big Up Transport Day, which was organised by transport unions and Hastings and District Trades Union Council, had walked around town giving out leaflets and engaging passers-by. 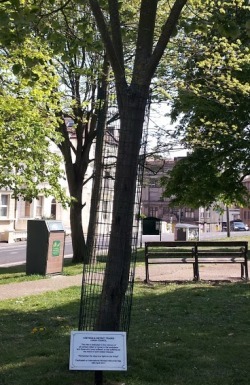 The route took in Cornwallis Gardens, where a tree was last week dedicated to safety at work in the name of the trades council. Big Up Transport Day came 24 hours after Sustainable Transport Day, which also included a meeting in Central Hall (see Joining forces for sustainable transport). But strangely there appeared to be little crossover between the two events, though presumably each would subscribe to the others’ aims.